Our laptops, tablets and mobile phones have become extensions of our limbs, and new, previously-unseen health problems are on the rise. Holiday time often means more screen time for kids and also checking emails on phone etc. We are seeing more and more people as a result of the technologically driven world we live in today. Whilst this world is all about instantaneous gratification where everything is done in a click of a button, it’s time we thought about the effects that will be felt further down the line. A 2010 British study found children with more than two hours screen time a day were 60 per cent more likely to have psychological problems, while iPad use increased the incidence of back pain in kids aged 11 to 16. Another recent UK study last year found that a huge 84 per cent of people aged 18 to 24 had experienced back pain in a 12-month period, causing them to lose an average of 1.5 working days each per year. And, a World Health Organisation study found that the incidence of lower back pain was higher in developed countries than in developing countries despite a lower rate of manual labour. The WHO cited “urbanization and industrialization” of the developed world as the culprit, implying “more repetitive movements and a loss of control over work scheduling”. From ‘text neck’ to ‘thumb stress’, here are the tech health problems that are on the rise. A new study from a New York doctor has revealed all that time spent hunched over your phone texting can have a lasting effect. According to the study, people spend an average of two to four hours a day with their heads bent over reading or texting on their phone. When you consider how heavy your head is (it makes up around eight per cent of your total body weight), it’s easy to see why your neck may suffer. As soon as we bend forward we increase the pressure on the spine. At a 60-degree angle, which is often how far people bend, the force on the spine can be equal to 27 kilograms. In the short term, this will lead to some pretty nasty neck pain. In the long term, you’re facing posture problems and accelerated degenerative decline. If you’re a constant text messager, you may have noticed pain in your thumbs, fingers, hands or arms after a particularly fervent gossip session. 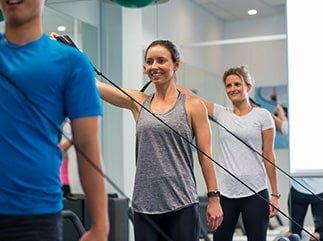 The condition tendonitis can arise from the repetition of a particular movement over time. Arm pain and nerve entrapments can also occur from typing on your phone or laptop. If you’re planning on writing a lot, switch to a desktop computer and leave your phone for shorter conversations. Technically, the perfect posture is when you’re long and tall through the neck, with your shoulder blades gently retracted and your ears in line with your shoulders. Desktop computers with the keyboard separated from the screen are really nice because they provide a neutral position of your body. However, as soon as you tie to keyboard to the screen like with a laptop, you’re basically forcing your eyes and hands to be in a similar position, which places demands on both. Basically, expect to end up looking like something out of the The Hunchback of Notre Dame. What’s worse, sitting for long periods can cause your hip flexes to tighten and your buttocks to weaken, leaving you with little mobility or stability. This can lead to chronic lower back pain. If you’d like one of our Physio to check your posture and give you some solutions to either help or prevent one of these new problems then please make an appointment today. 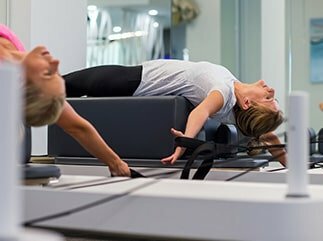 Many of our patients have found our Clinical Pilates programs to be a key in reducing their postural pain and improving the way their body feels and moves.